On Tuesday evening I was at the Royal College of General Practitioners in London to see Sir John Major deliver the annual NCVO Hinton Lecture. The former Prime Minister’s speech, titled ‘A Nation at Ease with Itself?’, focussed on inequality, poverty, fairness and social mobility. Addressing a voluntary sector audience, John Major reminded us that, as Chancellor of the Exchequer, he introduced Gift Aid and as Prime Minister he launched the National Lottery, 21 years ago. He had observed that it had become increasingly difficult for charities to compete for Treasury funds with pensions, social security, health spending etc. He saw the National Lottery as “money from the public for the public”, “to protect the independence of charities”. To date the Lottery has distributed over £34 billion to good causes and “as intended, most of this money has gone to small local schemes”. But John Major said he worries for the future of the Lottery. It was designed as a national lottery, in effect a monopoly, to maximise returns for the designated good causes but its success has attracted rivals, such as the increasing number of ‘society lotteries’ who pay a far smaller proportion of their income back to worthy causes. John Major also spoke about the importance of small charities, at a time when there is much emphasis on charity mergers. He said small charities “offer small, anonymous acts of kindness, vital to the recipient, that may be overlooked by their larger brethren”. He thought it would be wise to expand the remit and funding of the charity commission. He talked about the poverty of loneliness, saying it is not the responsibility of government to create communities. Rather this is something that has to involve government and charities and faith groups. He said the rise in single person households is a major risk to loneliness and “the community will deal with this issue best”. 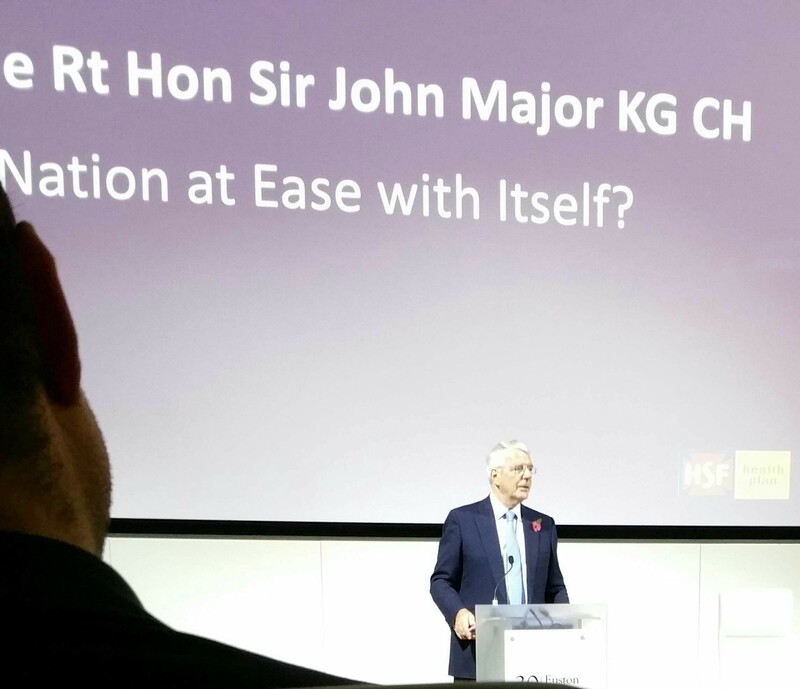 You can read the full transcript of Sir John Major’s speech at: https://www.ncvo.org.uk/about-us/media-centre/press-releases/1114-a-nation-at-ease-with-itself.